There are so many beautiful things in this world. I guess memories are the best. I've written many posts about horses getting old. The fact that my lovely thoroughbred mare Tintti is already 19 years old, makes me a little bit worried about the number of days we still have together. As many of my Finnish readers already know, my horse has Cushing's syndrome and she has been on medication for two years by now. Pergolid makes her more energetic and we're still going quite strong, training cross-country on the very easy level. We are not allowed to compete anymore, though. The biggest fear I have is that one day Cushing´s syndrome develops laminitis. I have already decided that Tintti doesn´t have to suffer that painful dicease several times again and again. But even if you decide to let go, it is never an easy decision to do. When I was a child, I collected horse hair from almost every horse I ever tacked. I even sent a letter to get some horsehair from a Finnish celebrity mare of the 1980's, Misty. Oh, how happy I was, when I got Misty's hair by mail. I recently found that letter and the hair. (Click here to see it.) Misty was a star, because she used to answer childrens horsey questions in a Finnish pony magazine, Hevoshullu. (literally ”Horse mad”). Her owner wrote also many Misty books. Many Finnish kids learned about horses via those books. As an adult, the need to keep the memories is almost the same as it was as a child. I still want to take pictures. I want to remember the velvet softness of my horse's nose when I'm grooming her. I love to watch videos and re-ride our very first and last time in eventing competition. There are moments when I've been sitting on the floor next to my horse's hay crying because of beeing so tired. But still, I've felt empowered because I have felt so blessed, because I have had the privilege to sit there in tears with the horse of my own, the one I cherish so much. For now on, I can carry Tintti with me in my bracelet I recently got from nannasalmi design. The horse hair is woven to a ribbon, and it gets the final touch from silver or golden details, such as bits or horse shoes. The result is completely unique bracelets, rings, pendants, earrings, tiebars, cufflinks and pendants: all made of the horsehair of the customer's own horses. 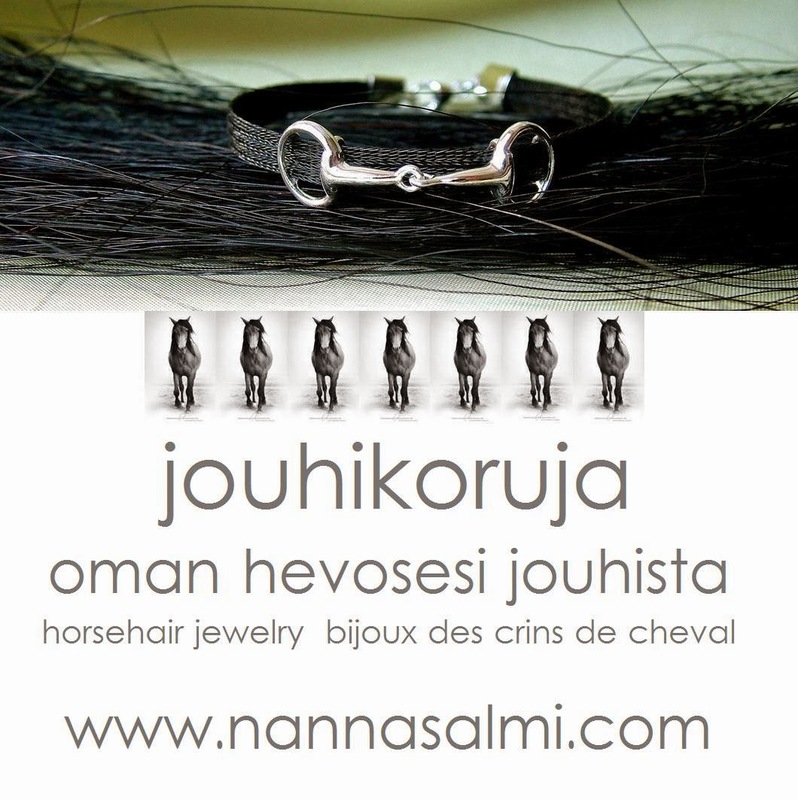 Although the horsehair jewellery of your own wouldn't be current to you right now, take a minute and visit nannasalmi.com to see the instructions of measuring the right amount of horsehair. Because, I am sure, one day you will find yourself thinking about the bracelet or a ring of your own. nannasalmi design has a Facebook page where you will a find the story behind the nannaalmi Horse Hair Jewellery as well as Nanna's interview. You will also be able to read many touching stories about horse jewellery and their owners. I am sure most of you will feel the same as the teenage girl who was banned from cutting a single hair from the horses she took care of, but how she collected all the loose hair and saved her pocket money- and got the bracelet of her dreams. All this kind of treasures are immeasurable!